Home/Food and Wine/Wine/Wine: Italian appellation system. Vini IGP (Wines with Protected Geographical Indication): This category (also traditionally implemented in Italy as IGT – Typical Geographical Indication) is reserved to wines produced in a specific territory within Italy and following a series of specific and precise regulations on authorized varieties, viticultural and vinification practices, organoleptic and chemico-physical characteristics, labeling instructions, etc. Currently (2014) there exist 118 IGPs/IGTs. Organic wine an organic wine in Italy, as elsewhere, refers to wines made from grapes produced in conformance with the principles of organic agriculture. This means that no chemical or artificial fertilizers, herbicides, pesticides or growth hormones or genetically-modified organisms (GMOs) are used in producing the grapes. Only certain natural preparations may be used against insects or plant diseases and only “natural” or organic preparations can be used as fertilizers. As such, it refers to work done in the vineyard and does not include work done in the cellar or the rest of the winemaking process.A wine in Italy produced from organic grapes is called a biologico wine (or vino biologico) and can be certified as organic by any one of a dozen or more national or international certification organizations. Not all organizations use the exact same standards for certification. But certification is a seal of approval or evidence that the producer has followed organic farming practices in the production of its wine and this certification can give the producer certain bragging rights in the marketing of its wines.However, it’s important to note that there are some Italian producers that follow the requirements for producing organically-certified wines and consider their wines organic but for various reasons have not pursued formal organic certification. Factors often cited for not pursuing certification include costs, time expended in compliance testing as well as the philisophical precept that what’s important is the end product and not certification per se. Biodynamic wine Biodynamic is a holistic, ecological and ethical approach to farming, gardening, food and nutrition.Biodynamics was first developed in the early 1920s based on the spiritual insights and practical suggestions of the Austrian writer, educator and social activist Dr.Rudolf Steiner (1861-1925).Today, the biodynamic movement encompasses thousands of successful gardens, farms, vineyards and agricultural operations of all kinds and sizes on all continents, in a wide variety of ecological and economic settings. Biodynamic Italian farmers strive to create a diversified, balanced farm ecosystem that generates health and fertility as much as possible from within the farm itself. Preparations made from fermented manure, minerals and herbs are used to help restore and harmonize the vital life forces of the farmand to enhance the nutrition, quality and flavor of the food being raised. Biodynamic practitioners also recognize and strive to work in cooperation with the subtle influences of the wider cosmos on soil, plant and animal health.Most biodynamic initiatives seek to embody triple bottom line approaches (ecological, social and economic sustainability), taking inspiration from Steiner’s insights into social and economic life as well as agriculture. Communmity supported agriculture (CSA), for example, was pioneered by biodynamic farmers, and manybiodynamic practitioners work in creative partnerships with other farms and with schools, medical and wellness facilities, restaurants, hotels, homes for social therapy and other organizations. Biodynamics is thus not just a holistic agricultural system but also a potent movement for new thinking and practices in all aspects of life connected to food and agriculture. A number of sub-categories also exist regulating the production of sparkling wines (e.g. Vino Spumante, Vino Spumante di Qualità, Vino Spumante di Qualità di Tipo Aromatico, Vino Frizzante). Within the DOP category, ‘Classico’ is a wine produced in the historically oldest part of the protected territory. ‘Superiore’ is a wine with at least 0.5 more alc%/vol than its correspondent regular DOP wine and produced using a smaller allowed quantity of grapes per hectare, generally yielding a higher quality. ‘Riserva’ is a wine that has been aged for a minimum period of time, depending on the typology (red, white, Traditional-method sparkling, Charmat-method sparkling). Sometimes, ‘Classico’ or ‘Superiore’ are themselves part of the name of the DOP (e.g. Chianti Classico DOCG or Soave Superiore DOCG). The Italian Ministry of Agriculture (MIPAAF) regularly publishes updates to the official classification. It is important to remark that looser regulations do not necessarily correspond to lower quality. In fact, many IGP wines are actually top level products, mainly due to the special skills of their producers (e.g. so called “Super Tuscan” wines are generally IGP wines, but there are also several other IGP wines of superior quality). Unlike France, Italy has never had an official classification of its best ‘crus’. Private initiatives like the Comitato Grandi Cru d’Italia (Committee of the Grand Crus of Italy) and the Instituto del Vino Italiano di Qualità—Grandi marchi (Institute of Quality Italian Wine—Great Brands) each gather a selection of renowned top Italian wine producers, in an attempt to unofficially represent the Italian wine excellence. GREATITALY can help you find the best Italian wines. Italian wine is one of the most difficult regions to get to know. Why? Well for one, the Italians use an esoteric wine labeling system, like the French. But that’s not even the biggest problem. The hardest part is learning all the different grape varieties.At the moment, there are about 350 official Italian wine varieties. 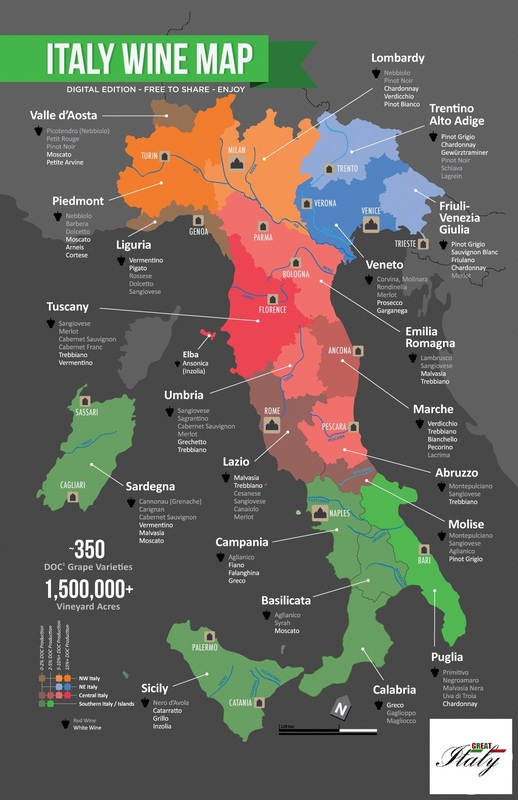 There have been …rumors that over 2,000 different Italian grapes exist, but this might be a bit of an exaggeration– something Italians do well.See an easy to understand map of Italian wine regions and major wine varieties. Learn about the 20 Italian wine regions and which ones to try first when delving into Italian wines.Italian Wine RegionsItaly produces a huge amount of table wine, vermouth and cooking wines (such as some Marsala). That said, there are 3 major regions that produce the most high quality drinking wines and they are: Veneto, Tuscany and Piedmont. means “controlled designation of origin” and is a quality assurance label for Italian wine and cheese. D.O.C.G. is the highest level of this assurance label. The list of Italian wine regions is organized by highest volume of D.O.C. wines. This removes all the grapes and wines produced for making vinegar and cooking wine and low quality table wine. Keep your eyes peeled for reds and a rich white wine called Soave. Veneto is known for the Valpolicella region which is known for producing Amarone della Valpolicella. Besides the great red blends of Valpolicella made with Corvina, Rondinella and Molinara, there are also several fine Merlot-based IGT wines in this area. For white wines, Garganega is the white grape that makes Soave (‘swah-vay’), a wine that’s rich like Chardonnay. Check out the article below on finding wines from Veneto. 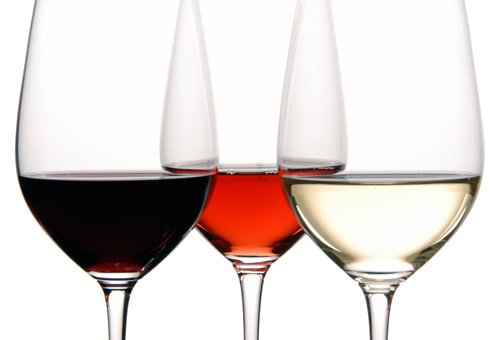 Try red wines from Tuscany as well as a sweet wine called Vin Santo. Tuscany is home to the Chianti region which is the most famous region for Sangiovese. When Sangiovese became the required major grape in Chianti during the 1970’s, the other noble grapes (Cab and Merlot) ended up creating a new style of wine: Super Tuscan. For white wines in this region, keep in mind that Trebbiano is Italy’s most produced white grape and Vermentino has quite a few taste similarities to Sauvignon Blanc. Try red wines and Moscato d’Asti from this area. Eat the cheese from Parma and drink Lambrusco. Lambrusco has long been thought of as a cheap sweet fruity wine. Now there are several outstanding off-dry to totally dry Lambruscos from Emilia-Romagna. Check out Pinot Nero and Sparkling wines from Lombardy. Valtellina is within Lombardy, close to Lake Como. Nebbiolo is the red wine produced here but it’s called Chiavennasca; it’s lighter and more ‘pinot’-like than its Piemontese sister. Lombardy also produces some great Pinot Noir (they call it Pinot Nero) especially around Oltrepò Pavese. The sparkling wine is called Franciacorta and is made with Pinot Noir, Chardonnay and Pinot Blanc grapes in the same style as Champagne. Look for great valued Sangiovese and Orvieto (a white wine). Sagrantino is the red grape variety in Umbria that people go crazy over. In Montefalco, you’ll find Sagrantino but there’s also a fair amount of strawberry-like Sangiovese in the region. The white grape here is called Grechetto which is one of the grapes in Orvieto. It’s minerally and zesty qualities are similar to Pinot Grigio with a distinct green almond flavor. Look for red wines from Abruzzo. Montepulciano is the primary red grape in Abruzzo and the wines are called Montepulciano d’Abruzzo. This is a bit confusing because there is also a Vino Nobile di Montepulciano which is a wine from Tuscany made with Sangiovese. Montepulciano (the grape) makes a dark rich wine with high tannins and an herbaceous character and is similar to Cabernet Sauvignon. Look for white wines and sparkling wines. This region is butted up to the Alps and makes fabulous white wines from Pinot Grigio, Pinot Bianco, Gewürztraminer and Müller-Thurgau (the latter two are sweeter). In Trento, they also produce a sparkling wine made with Pinot Noir and Chardonnay that easily rivals the best Champagne. Known for several unique and more intensely flavored styles of Pinot Grigio (including Ramato) and Sauvignon Blanc with a slightly meaty undertone. The area also produces some very savory and umami tasting Merlot. Try refreshing and aromatic Verdicchio white wines. Marche (Mar-kay) is known for their aromatic white wines. Verdicchio is definitely the most common, but Pecorino (the white wine grape, not the cheese) is an extremely special find. Lacrima is an up-and-coming grape from this area making fruity fun wines that reminded us of Syrah. Amazing valued reds made with Negroamaro and Primitivo. The fruit forward red wines from Puglia (Apulia) are a great way to get started with Italian wines. Most are very affordable and the region has a great number of esoteric sweet red wines that grow nowhere else in the world. Puglia is also a known value region for Chardonnay. With Rome located in Lazio, wine production is relatively small. Still, refreshing and zesty Grechetto can be found here along with Malvasia, an aromatic rich sweet wine. Try a red wine called Nero d’Avola. Red wines from Sicily are dark, rich and fruit forward because of the warm climate. Nero d’Avola is an awesome red variety that’s worthy of nobility. You gotta try Cannonau and Vermentino. At some point ampelographers discovered that Sardegna’s pride, Cannonau, is actually Grenache. In Sardegna (Sardinia), it tastes more rustic with dried fruit flavors. The wines from Sardegna (Sardinia) are highly aromatic and usually offered at a great value. Aglianico is a very high tannin and rustic red wine. Traditionally, it takes about 10 years of aging to be drinkable. Recently Aglianico wines have gained momentum as producers have figured out how to dial back Aglianico’s rugged meaty tannins. That said, there’s nothing more guttural than a 10 year-old traditional Taurasi. Also check out Greco, a refreshing white wine with a bitter almond finish. A very beautiful region that was not famous for their wines. Fortunately, some delicious white wine blends have surfaced with a tingle of salinity from the sea air. Perfect seafood wine. There is also a crazy producer of sparkling wines that ages them in the bottom of the sea. Greco is the white wine of choice in this region. Molise produces some interesting red wines. Awesome and intimidating Aglianico that is grown on the side of a Volcano. The smallest wine region in Italy, in the alps, producing some Pinot Noir rosé and two regional grapes, Petit Rouge (a red) and Petite Arvine (a white). As always, everything is fine! Always watch for new material! I read about the Internet and decided to do the same online store. All a Merry Christmas to you health and love! the internet people, its really really fastidious article on building up new web site. I have read so many posts about the blogger lovers except this paragraph is truly a nice piece of writing, keep it up. Great!!! I love what youve got to say. of writing, in my view its actually awesome for me. needs a lot more attention. I’ll probably be back again to read more, thanks for the info! Cool http://www.greatitaly.co.uk always done then you need to take the article, once even in your personal life helped! Develop and with the last Christmas to you all! Most bikers ought person to love the Trek and that is certainly worth trying out. You wants what is referred to as a snowball payment plan as an optional to credit card debt settlement. What i do not realize is in fact how you’re now not really much more neatly-preferred than you might be right now. to this topic, made me personally consider it from numerous varied angles. Its like men and women aren’t fascinated until it’s one thing to do with Lady gaga! folks I’ve read stuff from. Many thanks for posting when you’ve got the opportunity. is really a good paragraph, keep it up. It’s an awesome article for all the web users; they will take advantage from it I am sure. It’was very effortless to determine any topic on web in comparison with textbooks, because i found this paragraph at this particular webpage.